On September 17th, one minute after leaving Skydive Carolina’s Twin Otter aircraft from 14,000 feet, tears streamed down Tina’s face. This was a breakthrough moment, she hadn’t expected. While gliding under canopy, the reality of her past life and the beginning of her new life converged; this was the end of an ugly chapter and the beginning of a new future. Awash in the brightness of total clarity following a 29-year blur of physical and verbal abuse, Tina felt empowered. She was no longer a victim as she realized the shame she had been carrying for nearly three decades was no longer hers to bear. When the world perceives you to be an example of success, it can be a burden to maintain that façade. Tina had it all: three beautiful children, a lovely home in an affluent town, nice cars, toys, and a husband on a career trajectory that spelled more material wealth. What the world didn’t know was the ugly truth. Tina’s husband was a serial cheater and he’d project his guilt and anger on Tina in the form of verbal and physical abuse. No one knew of the raging fights that got physical. More than once Tina would formulate excuses to explain how she ended up with a black eye. The verbal abuse was worse than the physical as his message of her worthlessness took a toll to the point she started to believe it. Tina’s life was reduced to avoiding conflict and perpetually walking on eggshells as not to rock the boat. Her role was to be a great mother, project happiness and hide her inner feelings in order to maintain a sense of normalcy. This private hell was lonely and led to a state of depression that became her normal state of being. The only hope she could hold onto was that one day he would change. It’s ironic that in order to find life, you have to hit rock bottom. During a health scare in 2015 that left her weak and confined to her bed, clarity came in the form of solitary loneliness. The man who had promised to be with her “in sickness and in health” was seldom there emotionally. As her health improved, it was obvious that it was time to leave and in 2016 after 29 long years, she finally did. Tina was married at age 18. Now at 48, she is having to re-learn a new way of life. Her life is more simple; the financial security, house, and cars are gone, but she’s in a much better place with much less. 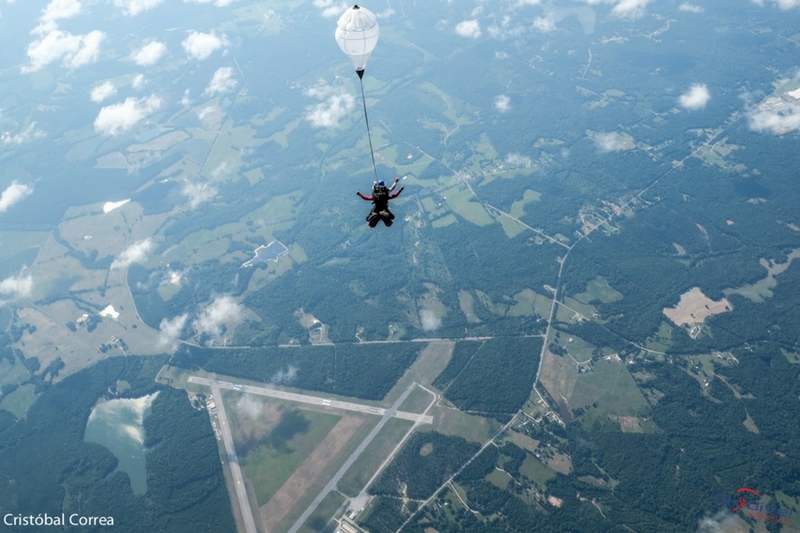 Today, Tina has begun a new journey and so it was that she came to Skydive Carolina in September, though she had no intention of making a skydive. Tina had come to support a friend who was making a milestone 200th skydive. While watching, she noticed all of the happy people walking in from the landing area. These people didn’t fit the mold of young kids in the prime of their lives conquering the world with a skydive. Instead, they were the young and old, moms, grandmothers, dads and grandfathers, different races and creeds. The common thread was everyone was returning with smiles that could hardly fit their faces and a joy that was coming out of every pore. Tina wanted some of that. She marched into the office and signed up for a tandem skydive the following day. “Skydiving was never on my bucket list! I told my friend, that he was nuts for skydiving! I just didn’t “get it”. I only went to Skydive Carolina to watch him jump and to take pics of his 200th skydive. 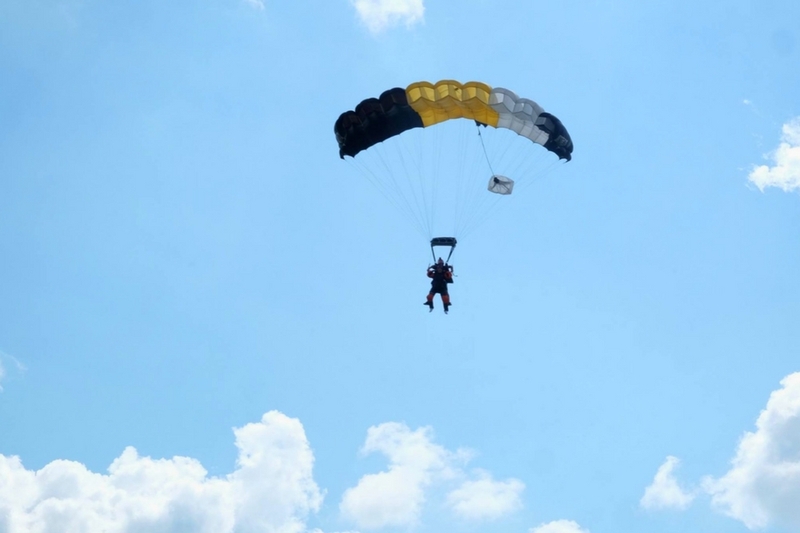 Funny, that same day, after talking to several skydivers and seeing all the smiles as people walked in from the field – I was all signed up and paid for my skydive to be done the next day. At 48 years of age, doing my tandem skydive was the most amazing, exhilarating, strengthening, and empowering thing I have ever done in my life! Recently divorced, after 29 years of marriage, this was the boost I needed to help me start – not a new chapter, but a brand new book! I have a picture as my cover photo on Facebook that’s been there for over a year. It’s been my focus during the separation and divorce process. It reads: “What if I fall?” “Oh, but my darling, what if you fly?” -e.h.
It’s Tina’s hope that her coming forward with her story will help others living through the same struggle. Coming out publicly is an act of courage in itself, but also part of the healing process. We were honored to be part of Tina’s story and grateful for her willingness to share it. If you are a person enduring domestic abuse, there are resources for help. If you are a person enduring domestic abuse, there are resources for help. Safe Passages – Providing supportive services to victims of domestic violence, sexual assault and child abuse in York, Chester, Lancaster and Union Counties. A list of SC Domestic Violence Help Programs throughout the state.